Artist's rendition of the Heinrich Hertz satellite. Credit: OHB Systems. 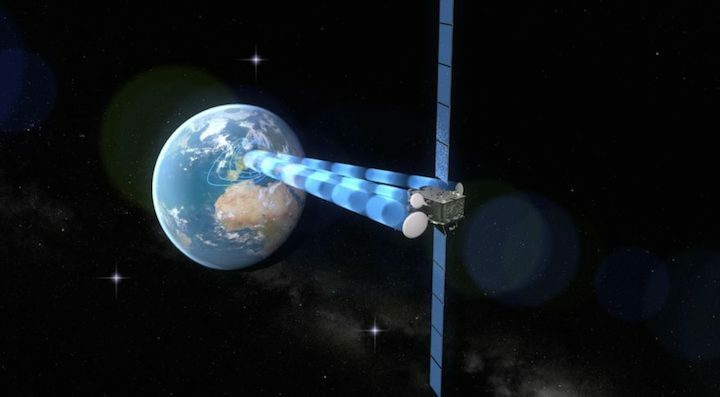 WASHINGTON — German satellite builder OHB Systems has secured a slot for the experimental Heinrich Hertz communications satellite on what could be one of the last Ariane 5 missions before Ariane 6 is expected to take over. The launch, arranged on behalf of the German space agency DLR, is slated for late 2021 or early 2022 — a transitional period during which Arianespace plans to launch a mix of Ariane 5 and Ariane 6 rockets while the newer vehicle gains acceptance. The first flight of the Ariane 6 is scheduled for July 2020 — a date ArianeGroup in September said remains firm. ArianeGroup and the European Space Agency are expecting Ariane 6 to cost about half as much as Ariane 5 in order to better compete on price against SpaceX’s Falcon 9 and other emerging launch systems. While Ariane 6 does have a first customer already — ESA has signed up for two Galileo launches — satellite operators can be slow to trust new launchers. Some may be reluctant to leave Ariane 5, which finishes 2017 with a track record of 82 consecutive successful launches. With a mass of 3,450 kilograms, Heinrich Hertz will likely launch in the lower berth of Ariane 5, leaving the upper position available for a heavier satellite. OHB is responsible for manufacturing, launch and the associated ground infrastructure for the DLR satellite. Heinrich Hertz is largely an experimental mission, carrying some 20 new technologies from German companies and academic institutions. The satellite also carries a Ku- and Ka-band military communications payload for Germany’s Federal Armed Forces, the Bundeswehr. In July, DLR selected OHB for a 310.5 million euro ($362.2 million) contract to build the satellite on an ESA-supported SmallGEO platform. Germany’s Federal Ministry for Economic Affairs and Energy is paying for the Heinrich Hertz mission. OHB’s first SmallGEO satellite, Hispasat 36-W-1, launched in January. Hispasat-36W-1, previously known as Hispasat-AG1, took seven years to complete; a build-time OHB says it will strive to bring down to three.